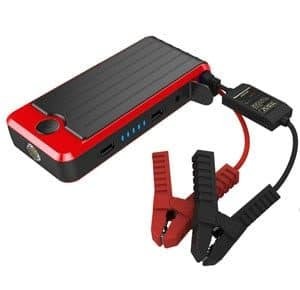 Don’t ever find yourself stuck on the road and consider choosing from these featured products on our best car jump starters in 2019 reviews. Before you head out, it is always practical to bring with you an emergency device that you can use to revive your vehicle’s dead battery. This way, you can reach your destination without sweating it out each time the battery dies down on you. When buying a jump starter, you need to consider the built-in features in the unit. Check the power it can offer, particularly if your car’s battery is completely drained. A powerful car jump starter can get your vehicle’s battery going after a few tries on crank-starting it. Consider reading the specifications of the product, so you can determine if the jump starter is exactly what you need. But always remember that the more power and capability it offers, the heavier it gets. Thus, you have to check carefully if the jump starter is just the right one you need based on its power, portability, and price point. 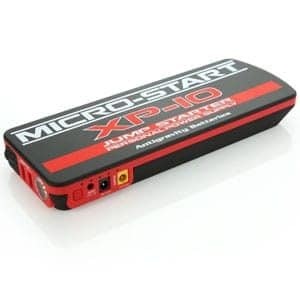 These are our top picks for the best car jump starters in 2019 reviews. Find out which among these items suit your needs after comparing the features of each product presented. Never find yourself stranded on the highway or elsewhere with your car. 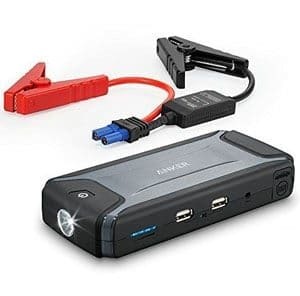 This car jump starter from Anker offers a versatile and user-friendly tool for you to bring back the power to your devices and car. It is good enough to jump start a vehicle (2.5 L diesel or 3 L gas), about 15 times with this unit on a single charge. 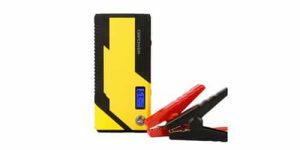 Plus, this is a portable and compact jump starter that you can put in your bag or in the glove compartment of your vehicle. With 2 USB ports included, you can also use this unit for charging your devices that are USB-compatible. The only thing we do not like much about this product is the way the manual is presented. Although the illustrations are easy to understand, the font used for the manual is very small and hard to read. Otherwise, this is a great jump starter that really works. If you have a gas engine or diesel engine up to 7.3 L, this device can be useful in jump starting your battery. With an 18000 mAh powerful capacity for this device, it is highly functional in providing power to your electronics and car battery. What’s more, there is a built-in LED flashlight that can come in handy during emergencies. There are 2 different flash patterns included and a steady beam that is ultra bright that can serve as a torch light or a signal when you need assistance on the road. As it is a lightweight unit at 18 ounces, it should be easy to bring it with you anywhere you go. Overall, we think that this device is a great investment worth our dollar. It is portable and compact, so there is no problem with taking it with us. As long as we have this in our car, we can rest easy knowing that there is no way for us to get stranded on the road. 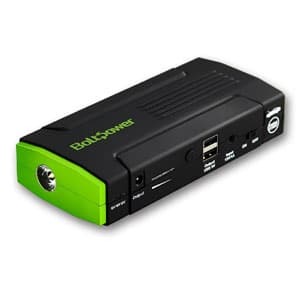 Boasting of its peak supply at 12000 mAh capacity of dependable backup power, this device can jump start vehicles using gas engines with a maximum of 6L. Aside from its capability to revive your battery that has gone empty on juice, you can count on this unit for charging a wide variety of devices such as your 19V laptop, USB devices, and other 12V devices or gadgets. This way, you have plenty of power for your devices while on the road. As this unit is just 15 ounces in weight, it is truly compact, portable, and lightweight enough to lug around anywhere you go. 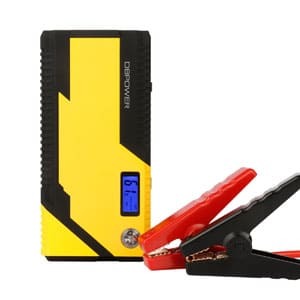 We like the feeling of being secured and confident that this jump starter never fails to bring power back to our dead batteries whether it is our car or our devices. As a bonus, it even has a built-in LED flashlight that comes with 2 types of flash patterns as an emergency signal and a steady ultra-bright beam. 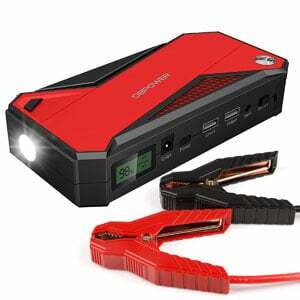 Feel safer whenever you are driving with this jump starter right inside glove box. This compact device comes with jumper clamps that offer safety features including protection from short circuit, over-charge, over-voltage, overload, and over current. You can use this for jump starting your gas engine vehicle up to 2.5L. Plus, this has a 8000 mAh power capacity, and it should be more than enough for charging devices including phones, kindles, tablets, and several others. The charging speed offered is at a maximum of 2.1 amps for each port. Here are just a few reminders when using this device. Be sure to avoid jump starting an engine with a maximum displacement that exceeds the unit’s capacity. Also, make it a point to fully charge the battery of this device to ensure the efficient performance of the jump starter. Pack light and smart before you travel on the road with this portable car jump starter. This robust device can jump-start a 2.5L diesel or 3L gas engine without any hassle, as it offers 500A of total peak current with cables and clamps included. It also functions as a charging port since it comes with a 12000 mAh capacity and a USB port for your devices such as tablets, laptops, and smartphones. It is also interesting to note that this unit has an LCD screen, so you can monitor the remaining power of the unit. Then, there is a bonus compass for easy navigation when you need to find your way back. You never can tell when emergencies will happen. This is why we are glad to have purchased this product that gives us the peace of mind whenever we go on a road trip. It is truly a must-have for trips outdoors including hiking, camping, and trekking. 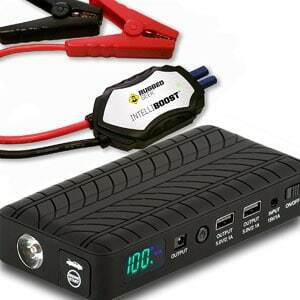 Always be prepared for what might come your way on the road by having this jump starter and smart charger in your car. This device is capable of jump starting a 5.2L diesel or 6.5L gas engine to get you back on track when your car battery dies on you. What’s more, there is a charging port added to this unit. If you have a USB-powered device such as a smartphone and tablet, you can extend the battery life by charging these using the smart USB port with a 18000 mAh capacity. Just be sure to check the LCD screen of this device to determine the power left as you use it for charging your devices. What’s not to love about this unit? Aside from its capability to jump start our vehicle, we can always count on it for charging our devices with completely drained batteries. No matter what types of electronics you have that rely on USB for charging, you can use this unit for boosting the juice in their battery. You can rely on the solid amount of power that this car jump starter can offer when your vehicle’s battery needs a little boost. Whether you have a motorcycle, car, boat, truck, or even a mower with a 5L diesel or 6.5L gas engine, this device should work like a charm. In fact, it functions in 3 different ways – as a jump starter, battery charger for your devices, and as a bright LED flashlight. This is why if you find yourself stuck on the road because your car’s battery died on you, this device can get you back on track. We are satisfied with how this unit functions. 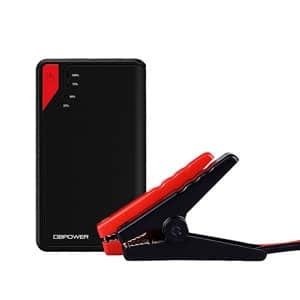 It is portable and dependable, and there is a convenient case included when you purchase this jump starter and charger in one. As long as you keep it in your glove compartment, you know that you can always find your way back home without contacting the towing service. 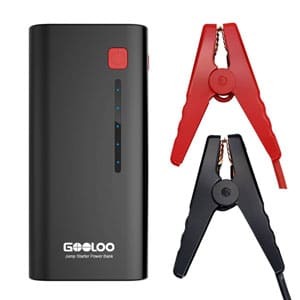 An outstanding companion for your travels, this jump starter and power bank can keep your devices and vehicle powered at all times. Just take it out of your glove box, use the cables and crank-start your car until you hear the engine roaring. In a few seconds, your vehicle should be good to go, thanks to this device. In the same way, you can power up your smartphone, camera, tablet, and similar gadgets using this tool as it also functions as a portable power bank with 2 USB ports included. There are indeed so many things to appreciate about this product. For the most part, it really works in charging dead batteries in a matter of seconds. Also, there are protective features built right into the unit such as the short circuit protection, overload protection, overcurrent protection, and over voltage protection. A robust and compact jump starter, this unit makes sure your vehicles are back on the road and running perfectly in a matter of seconds. Once the battery has died, just use the cable and charger to jump start it. You should hear the engine starting to work after a few seconds of charging the battery using this unit. It is also a USB charger at the same time since there is the micro USB, Lightning, and USB-C cables included. When you find yourself in an emergency as your car suddenly stops, this unit might help. It is a powerful jump starter and charger for devices, which make it a necessity when traveling – and you’re still far from home. This jump starter is what you need when your battery dies and there is no way that you are willing to spend a large amount of money for towing services. It even has different protection features including the ones for overload, overvoltage, and short circuit. And when charging your devices, you will appreciate how fast it can get them ready to use with a fast charge rate. Lightweight and compact, there should be no problem bringing this with you during your travels for peace of mind while driving. 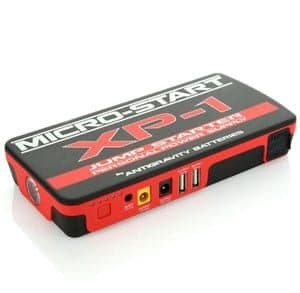 We know that we can always rely on this jump starter for our car’s battery and even for charging our devices. It is truly versatile, efficient, and a great emergency tool when we find ourselves stuck on the road with a dead battery. These are our best car jump starters in 2019 reviews. We hope you were able to discover which product works for you best after reading more about the features of each. With a powerful unit, you can be sure that your car keeps running to get you towards your destination all the time.